No matter what military branch is near and dear to your heart, support your troops with this great teddy bear! 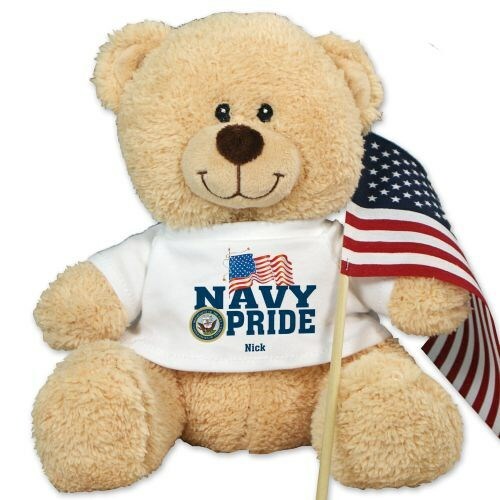 Your pride in the military won't go unnoticed when you show off this handsome Plush Teddy Bear. This military design is featured on our Sherman Teddy Bear. Sherman was established in 2012 and has become one of the sweetest teddy bears around! Sherman has an irresistible look on his face along with a wonderfully soft feel. He features contrasting tan fur on the inside of his ears and his snout. Surface washable and safe for all ages. Choose between three great sizes ranging from 11" to 21"! Free personalization of any military branch and name is included. American Flag is included along with Free Gift Wrapping and a Free Gift Card to create a thoughtful presentation. Additional Details Show your pride in our US Military with our great line of Plush Patriotic Teddy Bears. Our collection of Stuffed Animals support our great USA & our troops in the military! Our Home of the Free Sherman Teddy Bear is also a great way to show your never ending support.